When Aidialys “Ady” Roman’s brother battled cancer a few years she saw how tough the disease can be on kids. She saw her brother develop a fever and become unable to get up during intensive rounds of chemotherapy. She saw him celebrate his birthday and New Year’s as a patient at Saint Peter’s University Hospital in New Brunswick. “I was really bad,” said David Roman, 13, Ady’s brother. 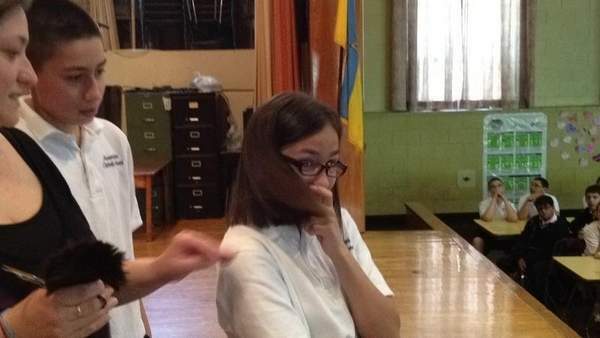 “It brought our family closer together and closer to God,” said Ady, 11, a fifth-grade student at Assumption Catholic School in Perth Amboy where her brother is in sixth grade. When Ady saw girls in the hospital who had no hair from chemotherapy treatments, she wanted to do something to help other children with cancer. Friday, she did. With her brother, who now is healthy, by her side, Ady stood on the school auditorium stage in front of her fellow students while her mother, Frances Roman, cut her yard long dark hair to donate to Locks of Love, a nonprofit organization that provides hairpieces to needy children suffering from long-term medical hair loss. The hair-cutting/social responsibility demonstration was organized by fourth-grade teacher Lynda Rizkallah, who had been Ady’s second-grade teacher during the year her brother was sick. Roman said Rizkallah was helpful in offering her daughter support at a time when the family was devoting most of their time and efforts into helping David get better. Ady considers Rizkallah to be a family friend, in addition to her former teacher. Although the family tried to mask the seriousness of the disease so David would continue fighting it, Ady figured out her brother had cancer after seeing the children in the hospital rooms next to her brother with no hair and being treated for cancer. “She figured it out,” said Roman, adding that her daughter said she felt bad for the children with no hair. She said Ady’s perceptions were further realized when she saw her brother lose his hair. “She felt sad and knew he had cancer,” Roman said. It was while her brother was sick that Ady told her mother she wanted to let her hair grow and donate it to children suffering hair loss from cancer. “I think it’s real good she’s doing this so somebody can just have hair instead of no hair,” said David, who has checkups every four months and an annual CAT scan but takes no medication. Ady, who had her last haircut when she was about 5, said her hair has always been long. But she’s happy to have it shorter for the summer and the upcoming school dance when she will have curls in her hair. But then she will resume growing her hair. “I want to donate more hair,” said Ady, adding that next time she wants to grow her hair even longer. Here is the link and video to the newspaper article about Ady donating her hair.